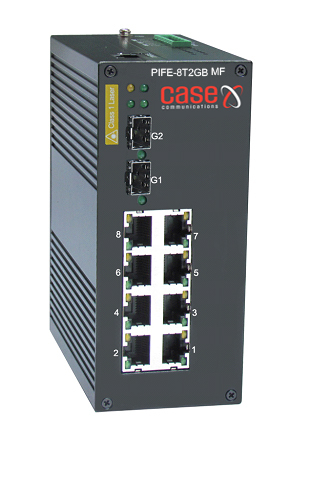 Case Communications Industrial Switches are designed to work in critical network environment using IP 40 enclosures and tested to extensive Industrial EMI and Safety standards. The PIFE 8T 2GB-MF Industrial PoE Plus Ethernet Switch uses Advanced Ring feature which provides an auto-recovery-path within 20ms when the primary network path has failed. The ring can be established with up to two hundred and fifty Industrial Switches. Case Communications Dual-Homing feature can ensure resilience between a ring and dual head end switches. Features include QoS for 4 queues, 801.q VLAN, IGMP snooping and query mode as well as SNTP and SMTP. An Industrial Switch relay contact to Alarm system can immediately notify of Power failure and/or Port down events.In case of events, the Case Communications IFE 8T 2GB-MF will immediately send an email to a pre-defined addresses.The IFE 8T 2GB-MF is ideal for use in Automation, Transportation, the Oil and Gas Industries, Semi-conductor manufacturing and heavy industrial factory and other factory assembly lines.The IFE 8T 2GB-MF is particulary suitable for real IP-multicasting with Video Encoder/Decoder for Traffic Control, MOD application.